Because of all the plastic spoons that restaurants, fro-yo places etc have, and how much I don't want to be using them- my family considered various solutions for a while before settling on SPORKS! So now we all have our sporks. TG and her dad carry small stainless steel multi-tool ones on their key rings, William and I have Snow Peak Titanium Sporks. They got a great reviews because they have deep tines that are polished smooth and nice deep bowls. But even with polished tines it needed protection so it wouldn't snag things in my purse. The other thing that I needed for a spork holder in my purse was no buttons or ties to snag on other things. So I designed this spork sweater! It's worked from the bottom of the spork up, then has a flap like an old fashioned sandwich bag that flips over to close. Because sporks come in different sizes, and because I use Boye steel hooks which are sized differently from the other major hook brands- this is a tutorial instead of a pattern. Because it's a tutorial rather than a step by step pattern, just use whatever hook size works for you and the thread you choose. I used size 5 thread- Bernat Handicrafter Crochet Thread in Iris, it's a very soft, easy care acrylic fashion thread. Start by chaining a length as long as the width of the handle of your spork. Chain 1 extra to turn, and slip stitch down the length to reinforce the chain. Rnd 1:Ch 1 tightly to turn, and single crochet in each stitch on one side of the slip stitched chain, at the end, 3 sc in that stitch, sc in the other side of each stitch, 2 sc in last st, slip stitch to join. Rnd 2: Ch 1, sc in each st around, sl st to join to first sc. Repeat Rnd 2 until it's long enough for the handle of your spork. 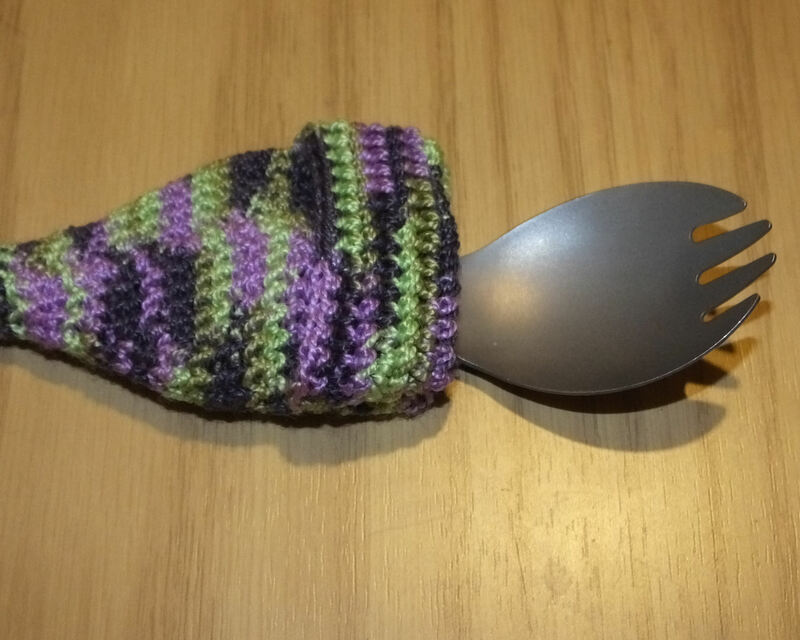 The next part is a little trickier, you'll be widening the cosy to fit the bowl of your spork. 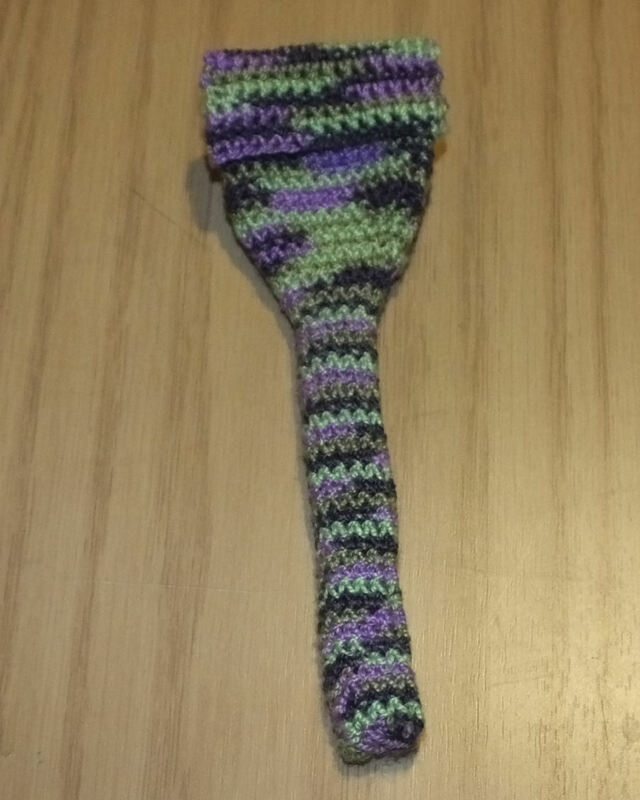 Single crochet until you reach the stitch that's on one side of your round, 3 sc in that stitch, put a piece of a contrasting color thread or a small stitch marker in second stitch of the 3 sc, go down the other side, and do the same on the other side. slip stitch to join. Ch 1, single crochet in each stitch. Slip stitch to join. Now it's all up to your judgement, for my spork, I did another plain row, then increased on the next row. Each increase will be 3 stitches centered in the side stitches, so marking the middle stitch makes it easy to find where the next increase goes. Mine was mostly 2 or 3 plain rows, then an increase until each side was 12 stitches, with the 1 stitch on each side for 26 stitches around total. When it's wide enough for the bowl of your spoon, keep crocheting plain rounds until it's long enough to cover the bowl, and one extra round past that. Chain 1 to turn, and single crochet across. I used reverse single crochet every other row to keep it from developing the ridges in single crochet, but single crochet works too. You want to do 8 or 10 rows of single crochet. Break off thread, leaving a long tail for sewing. Fold the flap over the top of the cosy, and sew down the flap along the sides using the tails of the thread, Knot off securely and weave in ends. Everyone in my family carries a spork so that we don't use disposable cutlery while we are out. Many campers also use sporks still. But mostly because I could. 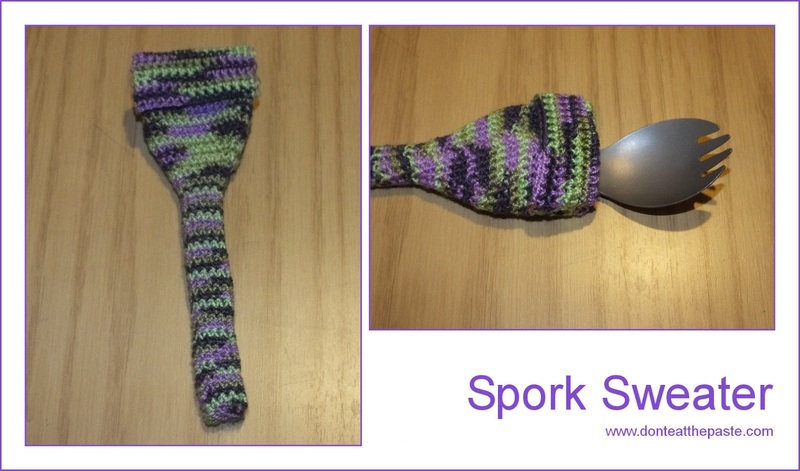 :) I could just keep my spork in a plastic or cloth bag but love the silliness of a spork sweater.